Media is largely silent on arrests and abductions while political class switches between showing acceptance and accusing India and Afghanistan. Pakistan’s powerful Pashtun Tahaffuz Movement is no longer just about the Pashtuns. In the past year, this extraordinarily brave and non-violent movement has brought into its fold the support of disaffected Sindhis, Mohajirs and the Baloch, who have also suffered enforced disappearances for decades. And they are all intrepidly staring down an oppressive state in Pakistan. The intelligence agencies have set-off a chain reaction of protests and abductions in what appears to be an unending cycle. On February 5, Pakistani media beamed live Jamat-ud-Dawa led Kashmir Day protest outside the press club in Islamabad against Indian security forces’ human rights abuses in Indian administered Kashmir, while the police was cracking down on a peaceful PTM protest in the same area. They were protesting the murder of Professor Arman Loni, a core PTM member, at the hands of a police officer three days ago. “Dozens of television and newspaper photographers raced from one end to another trying to capture each arrest on camera. But it was just their journalistic instincts kicking in – not a race to be first to actually cover the drama. Because, while their TV channels thoroughly covered Kashmir Day events… none of the videos of the arrests of the activists made it to the TV screens. Nor did they make headlines in the morning newspapers,” wrote BBC’s Mohammad Ilyas Khan. The arrests included that of internationally renowned activist Gulalai Ismail, whose whereabouts had remained unknown for over forty hours. This triggered a backlash on Twitter, and announcement of further protests. Gulalai was set free as a result of the outcry, but the others remain incarcerated. Politicians and experts kept delivering traditional statements on Kashmir, but none spoke of the human rights abuse happening under their noses by their own government. On February 9, the police arrested Lahore-based academic Ammar Ali Jan for what the professor described was “for participating at the protest… against the killing of Professor Arman Loni”, while TV host Rizwanur Razi ‘Dada’ was booked by the Federal Investigation Agency for his “defamatory and obnoxious” posts on social media. Both have since been released on bail. But the more the atrocities have grown, the more the PTM has drawn supporters. 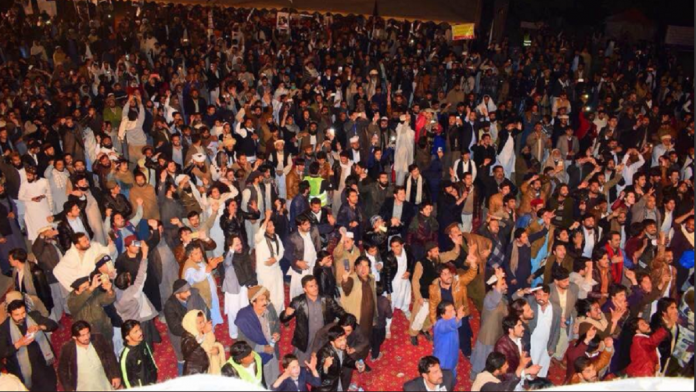 In February 2018, when it burst onto Islamabad in the form of a ten-day ‘dharna’ (sit-in) to protest the extrajudicial killing of a 27-year-old man, Naqeebullah Mehsud, no one could have fathomed that the PTM would evolve into a popular and resilient mass movement that it has. A year on, the target of the PTM’s grievances remains the Pakistani military, since the military remains in control of erstwhile Federally Administered Tribal Areas (FATA), despite its legal merger with Khyber Pakhtunkhwa via an Act of parliament in May last year. And the military reacts in the only manner it knows. The state’s response has been abysmal in its nervous and confused approach: tyrannical and conflicting in turns. From attempting to physically prevent the protests, to imposing a complete blackout of the PTM on the media, jamming mobile and internet signals, registering fake cases of terrorism, to harassment and threats, abduction of members and supporters, murder of organisers, internal and foreign travel bans, to bullying and abusing supporters on social media, vacillating between veiled accusations of waging a “fifth generation war”/ being foreign controlled and funded. Yet, on different occasions, the military’s spokesperson, the DG-ISPR, has acknowledged the justness of the PTM’s demands and the peaceful nature of the movement, even acknowledging the suffering of Pashtuns of erstwhile FATA and delivering warnings not to cross the line. Moreover, and in a rather farcical twist from the crackdown on February 5, many politicians and talking heads suddenly acknowledged the existence of the PTM and owned it as Pakistani. This, as Afghanistan President Ashraf Ghani tweeted to express “serious concerns about the violence perpetrated against peaceful protesters and civil activists in Khyber Pakhtunkhwa and Balochistan” and lectured Pakistan on its moral responsibility. The reaction from Pakistan ranged from accusing Ghani of gross interference in its “internal matter”, taunting him about not being included in the US-Taliban talks, and calling it “proof” that the PTM was Afghan/NDS/India/RAW sponsored. The usual suspects even trended #PTMAfghanNexus. None saw the irony in suddenly talking about a year old movement after ignoring it for so long. Even as the PTM’s demands remain largely unmet, its support, voice, and influence grow. It was the PTM protests that encouraged a tribal Wazir woman to speak up about sexual harassment at the hands of the Pakistani military. This is unprecedented because honour prevents men and women of the tribal areas from speaking of dishonour of womenfolk. A video of a Wazir child from Mir Ali, North Waziristan, alleging repeated sexual harassment of the female members of his household at the hands of army officers (all elder males had been taken away by the security forces) had gone viral a couple of weeks earlier that provoked national outrage and PTM protests. When the usual suspects denied the claims, the woman, encouraged by the PTM’s support, repeated her son’s claims in a video statement, from behind the traditional burqa. The movement is rooted in the long-simmering anger and despair in Pakistan’s erstwhile FATA. The people have been crushed between the militants and the military for decades. Naqeebullah’s tragic murder at the hands of a notorious police officer gave birth to the PTM a year ago, before which its young, charismatic leader Manzoor Pashteen had been leading its forerunner, the Mehsood Tahafuzz Movement for South Waziristan. It evolved into the PTM, and swiftly expanded its demands from getting justice for Naqueebullah to recovery of missing persons, ending the humiliation at hundreds of checkposts dotting FATA, the clearance of landmines, an end to the practice of collective punishment against the Pashtuns of FATA, and the formation of a Truth & Reconciliation Commission. But the movement remains just that: a movement. The question that looms large is whether it should now structure itself into a political party and formally participate in parliamentary politics. Two of its top leaders, Ali Wazir and Mohsin Dawar, won in the general election last year and entered parliament, but as independents. This, in itself, has raised the PTM’s profile and amplified its voice: these two have raised in the national assembly those thorny issues that were rarely spoken of before, not only effectively countering the censorship otherwise imposed on PTM leaders, but also helping to bring hitherto unspoken of deeply problematic fault lines to the national conversation. Things will have to change. The chaos is simply unsustainable in the long term. The only workable way forward is for the state to begin to abide by the social contract it supposedly has with its citizens. Gul Bukhari is a Pakistani columnist and human rights defender.